If given the opportunity to speak to a room of 1000 oncologists, surgeons and radiologists, what would your message be? I had this once in a lifetime opportunity a few weeks ago as I was invited to be the patient keynote speaker at The Miami Breast Cancer Conference. It was my first time speaking to doctors/professionals so I have to admit that I felt somewhat intimidated, yet at the same time exhilerated. I had so much that I wanted to say. I got to speak alongside Dr Patrick Borgen, the man who uncovered my misdiagnosis and saved my life when my then oncologist was giving up hope. Our story and emphasizing the power of hope in of itself is very powerful, but given this opportunity, I had much more that I wanted to convey. When diagnosed with cancer, you get all kinds of numbers and statistics thrown at you and it’s terrifying, especially if you buy into the system and believe that these statistics are your personal truth. I don’t know how many times I have been given grim statistics that have scared the sh*t out of me. And while MBC has taken the lives of so many women I have come to know and love, I will never stop believeing that there is ALWAYS hope. 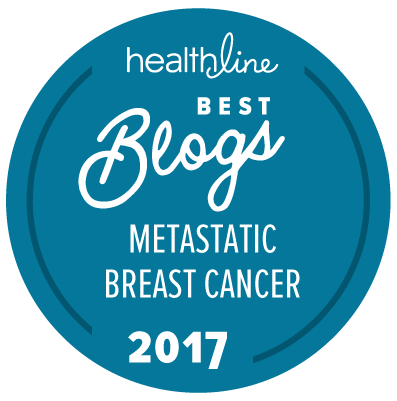 Far too often, as patients, we are given the ‘worst case scenarios.’ And while it is a doctor’s obligation to give us the cold, hard ‘facts’, I believe it is as equally important to let patients know that there are outliers and it is VERY possible to live a long life and thrive with MBC, or even be cured for that matter. I know several women who are now cancer free or NED (no edivence of disease) despite a stage 4 diagnosis. Our minds are so much more powerful then we give them credit for. I believe the power of the mind is without limit and that the way we think, essentially affects the way our bodies function. Thinking negativly or positivly affects our bodies and therefore our healing. Giving daunting statistics and little hope can have a negative impact on a patient’s outcome. On the contrary, giving a patient the best case scenario or offering hope can have a postitive impact on one’s mental and physical health. So why not offer both? I offered this message and concluded this point by sharing the fact that when one doctor gave up hope and told me there was nothing left that she could do for me, another stepped in and changed my perception and restored my faith and will to survive. As sick as I was, Dr Borgen told me that he believed “10,000 that WE were going to beat this.” His words renewed my spirit and the hope he offered saved my life. He was the only doctor up until this point in my journey that ever vocalized believing in me. Letting the patient have a voice in decision making is extremely important. Ultimatly the oncologist is the quarterback, but a cancer diagnosis and treatemnt requires a team and a patient should very much be a part of that team when it comes to input and decision making. While we may not totally understand the science behind the cancer, we do know our bodies best. Years ago when a second tumor started to grow in my chest (and pretty aggressively), my then oncologist was giving me all types of new treatmenst specific to my diagnosis and none of them were working. This didn’t make sense to me. I had heard that cancer could morph or change and perhaps this tumor was not the same type of breast cancer as the initial. With this in mind, I requested a biopsy on more than one ocassion but was told that it was not necessary. Had I not found Dr Borgen who biosied and uncovered my misdiagnosis, and instead relied on the care and decision making of my then oncologist, I wouldn’t be here today to share my story. We know our bodies best, so please listen to our requests and concerns. After my talk several amazing oncologists approaced me and shared with me that if a patient doesn’t respond to treatment under their care within a few months, they automatically re-biopsy to see if the cancer or diagnosis has changed. What incredible doctors there are and this approach would be so beneficial for all doctors and all patients. Isn’t what we consume as equally important as to what we put into our veins? I certainly believe so. I was misdiagnosed (read about it here) and was given the wrong drugs for over 4 years with a stage 4 diagnosis and managed to survive. In hindsight, I often wonder what impact those wrong drugs had on me, but I’m alive and that’s what matters. I know for fact however, that all of the alternative therapies I make a part of my everyday life were/are instrumental in keeping me alive. I made sure to touch on what I had done over the years including radically changing my diet, taking Chinese herbs, supplementing, using cannabis and above all, my mostly unwavering faith. I wasn’t sure how this point would be received given my audience was mostly from the Western world of Medical Oncology, but I was blown away by their acceptance of what I had to share. Some even offered their input during the Q & A session and agreed that they too have seen Chinese Medicine work although it is hard to study and publish the results in a medical journal as it is individualized medicine. In other words, it’s not a one size fits all approach. One woman even commented that while there are no clinical studies, the patients in her practice who are spiritual tend to do better than whose who are not. Yes! It was such an honor to initiate and be a part of this conversation. There needs to be a standard of care requiring pathology reports and results to be read and determined by more than just one set of eyes. The pathologist who read my initial biopsy results incorrectly, forever altered my life. Whether not having an adequate night’s rest or not having their morning coffee was the cause, this one person had way too much power! Their insanely incorrect interpretation of my results is what caused me to be on all of the wrong treatments for over 4 years. This could have costsed me my life. And through my years of advocating for young women with breast cancer, this is alarmingly a very common occurrence. I lost someone very special to me this past year due to misdiagnosis. (Michelle Zwirn, I love with my whole heart and promise you I will continue to do this work until I make a difference for us all). While human error is something that is inevitable, if there is a collective consesus, so many lives can and will be spared. It’s too much responsibilty for any one prson to have. It just makes sense and would be a win win approach to implement this as standard of care. Some oncologists were moved to tears after hearing my story and many approached me with questions and such positive feedback. Often times we (myslef included) get intimated by the white coats and hospital settings but one major takeaway for me after this weekend was the fact that doctors are human beings, just like the rest of us. They have emotions and are compassionate individuals who have dedicated their lives to helping us. Their job is not an easy one by any means. Just as I provided a glimpse into what it’s like to be a patient, I had a glimpse into what it’s like to be a doctor. I am so humbled that I was chosen to be a part of such an incredible weekend at Miami Breast this year. It was an honor to share my story and all that I have prevailed through in the hopes of changing perceptions. I believe that by sharing my truth I served as a voice for cancer patients around the world and hopefully, even if small, I made a postive impact on the future of our care. « Find me in Florida: CAM Conference, Thriver MeetUp and Miami Breast!